Groupers are members of the large subfamily Epinephelinae which contains over 16. Groupers are a commonly kept group of marine fishes due to their large size and personalities. The size of these fish, coupled with the patterns and colors of some grouper species make then wonderful show specimens for a large marine tank. The Polleni Grouper (Cephalopholis polleni) is one of the most commonly sold grouper species, and its purple and yellow patterning are very distinctive. Other grouper species frequently seen for sale in the aquarium trade include the Miniatus Grouper (Cephalopholis miniatus), as well as the Blueline Grouper (Cephalopholis formosa). Groupers have a broad distribution and can be found in all the worlds oceans, as well as in some brackish environments. Groupers exhibit an extreme range of sizes, from mere inches to many feet long and weighing hundreds of founds. Groupers display multiple reproductive strategies. In many species, individuals all mature as females, and only the most dominant fish in a group will become a reproductive male. Other grouper species are gonochoristic, meaning they are born with predetermined gender. Groupers also display a wide range of habitat preferences, with some species living solitary lives hidden in caves, and others forming large open water aggregations. Groupers can make great aquarium inhabitants, provided their husbandry needs such as diet, water quality and tank space are met. One of the most important aspects of grouper care is tank size, being large fish, groupers require very large tanks to thrive. 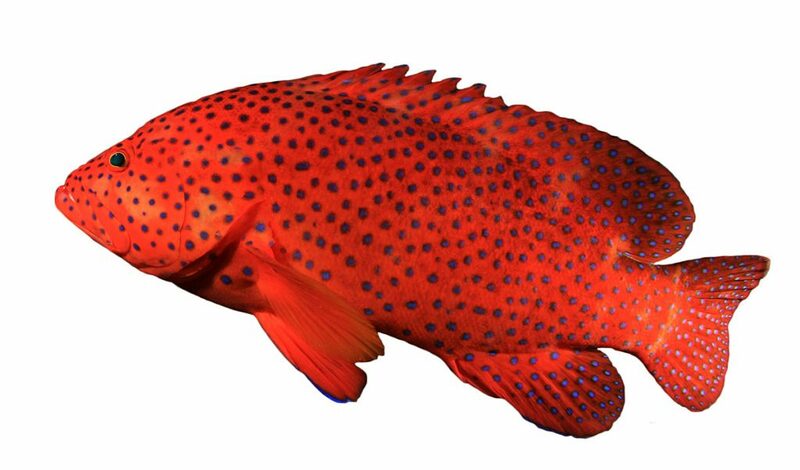 Most tropical groupers prefer a temperature range of 72F (22C) to 80F (26C). Groupers are not generally considered a reef safe fish as they will readily consume any fish or invertebrates small enough to be consumed. However, groupers do not pose a direct threat to corals, so they may be kept in a reef tank with only large fish as companions. It is important to consider carefully what species of grouper may be best for your aquarium. While smaller species such as the Polleni Grouper (Cephalopholis polleni) are suited to tanks as small as BLANK GALLONS, larger species such as the Panther Grouper (Chromileptis altivelis) may be better suited to a larger tank. We suggest a diet based on Piscine Energetics Frozen Mysis, Piscine Energetics Frozen Calanus, Piscine Energetics Pellets (2mm and 2mm) and Piscine Energetics Saltwater Flakes.